Passion: We value intense pursuit of our company’s mission. Respect: We value our people, customers, partners, diversity and the environment. Innovation: We value creativity and continuous improvement. Dedication to Excellence: We value acting as one team to deliver quality and value in all we do. Ethics and Integrity: We value honesty, transparency and ethical behavior. iGPS, which has been providing innovative, world-class supply chain solutions to markets throughout the U.S., has created a sustainable shipping platform that is disrupting the dynamics of the industry. iGPS’s recent growth in new business recognizes the shift from traditional pallets to the more protective and sustainable platform provided through iGPS. The key is the company’s plastic pallet pooling system, which provides lighter, safer, stronger recyclable and more environmentally friendly pallets than wooden counterparts. Because iGPS’ pallets always are of consistent size specification, have no protruding nails, eliminate splinters, have a crucifix bottom deck, engineered corners and cannot absorb bacteria, they have structural reliability and cleanliness, no contamination, greater stability and less interruption of the automated manufacturing or shipping processes. In fact, this system creates a complete “flow-through efficiency”, which is novel to the iGPS pallet. Just as important, that process simplification also reduces product damage. By eliminating the shards, splinters, cracks, nails and surface contamination of standard pallets, the iGPS platform removes the primary elements that, otherwise, contribute to product damage – as well as hygiene concerns. Yet, the advantages go even further. This sturdier and greener iGPS platform also introduces three critical elements into the supply chain: 1) Sustainability; 2) Cost Savings; and 3) and Efficiency. Improved Sustainability: A comprehensive independent life-cycle analysis examined the cradle-to-grave impact of all three types of pallets, finding that the iGPS platform had dramatically less impact on all measured dimensions. Since they are 27 pounds lighter than typical wood pallets, requiring far less transport fuel, the iGPS platforms actually reduce pollution and greenhouse gas emissions. Also, the new iGPS Generation 3 (Next Gen ) pallets are 100% recyclable. Proven Cost Savings: An independent study also found that when supply chains in produce, dairy and protein switch to the iGPS platform, those companies have enjoyed meaningful savings per pallet load. The results were unambiguous, accruing across all stages of the supply chain, with benefits for both manufacturers/growers, shippers and retailers. 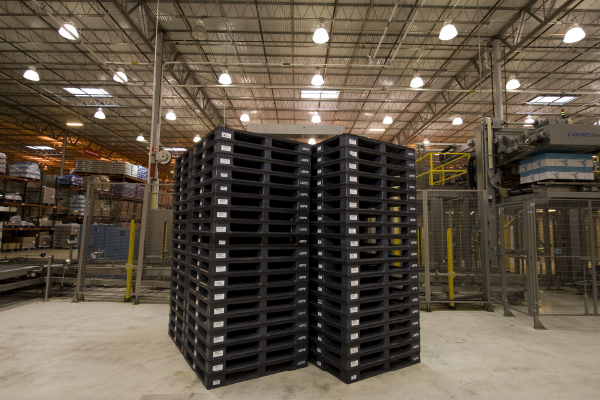 Greater Efficiency: All iGPS pallets are constructed of sturdy, lightweight (48.5 lbs.) plastic, in true 48” x 40” size. Always exceeding or meeting ISO and GMA standards, the iGPS platform is the only pallet to receive NSF’s Food Equipment Certification – of critical importance in today’s high tech ASRS, AGV, robotic and food safety sensitive environment. IGPS pallets are always in excellent, uniform condition, creating greater efficiency through simplicity and consistency in the supply chain. It’s no wonder that iGPS has seen a significant increase in customers and expanded use among existing clients within just the past year. This has included new agreements with Ainsworth Pet Nutrition, Niagara Bottling, Nestle Waters and Gerawan Farms among others.